Inkjet printers, although a little outdated, is still very popular. Not the last role in this is the ability to refill cartridges yourself. Every time the paint ends, tucking the cartridge with ink, instead of buying new, you can save a lot of money. You can buy a bottle of ink, which will last for quite a long time. You can also save money on printing photos. You can buy a few bottles of colored ink and print the photos yourself. The process of refilling cartridges is considered an example of Canon printer. When you purchase printer ink, please note if any of the printer models for which designed ink your model. Need to buy ink for your model, otherwise, the printout file will be incorrect. Turn on the computer. After the operating system has loaded, click on the printer power button. Wait a few seconds until it starts. Then open the printer cover, then the carriage with the printheads will begin to shift. Wait until it stops. When the print head will be in a static position, remove the print cartridge from the slot. To do this, just gently pull it toward you. In the place where you fill the cartridge, lay a few Newspapers, so that nothing is dirty. For this procedure you will need a syringe and needle. The capacity of the syringe is unimportant. Fill the syringe about 5 ml. of ink. Take the cartridge side of the print head to you. Gently insert the needle into the printhead. Strongly do not need to enter. The main thing a little squeeze. Now slowly with the syringe to inject ink into the cartridge. If you put a color cartridge, respectively, there need to introduce several colors of ink. Each printhead has its own color, in which you need to enter the paint. After the cartridge is filled with ink, reinsert it into the compartment. To do this, simply insert the cartridge into the slot and apply some pressure until you hear a click. A clicking sound indicates that the cartridge is fixed. Close the printer cover. Open the printer software and reset ink level sensor. If not, the system will incorrectly display the remains of ink in the cartridge and will not be able to issue notification of a low ink level. Cartridges of the type CL-41 are used in many models of inkjet printers by Canon. Their capacity is relatively small, and under intensive printing, they quickly spent. Place the color cartridge Canon CL-41 so that the contact area of the cartridge was tilted away from you. Remove the sticker, placed on the surface of the cartridge. Inside it is divided into three compartments. In the upper compartment are red ink in the lower left – blue, bottom right is yellow. With the help of a drill or an awl do in each of the compartments of the filling hole. Take a disposable syringe, put the needle on it and fill approximately 6 grams of ink of the same color. Insert the syringe needle into the corresponding color of the filling hole. Be careful not to mix up the ink color. Inside the compartment is a sponge – pierce it, but not through, and until about the middle. If you get the needle up to the bottom of the cartridge, subsequent use. it will flow, and this defect will not be repaired. Slowly begin to inject ink. Do not use considerable effort – otherwise you may get a fountain of ink-stained clothing and premises, and to remove them is not so easy. If you notice that the ink begins to flow from the filling hole, immediately stop the process and using a syringe, pull back approximately 1 gram of refillable ink. After filling seal holes with duct tape, electrical tape or the glue gun. The latter option is preferable, since the adhesive securely walled in you have done the filling hole. Using a fine needle puncture a small vent hole in the tape or duct tape. If you used a glue gun, do it near a gas station. This step is required, otherwise the cartridge will not work. After you install the ink cartridges back make some color prints to clean the printheads and check the quality of filling. 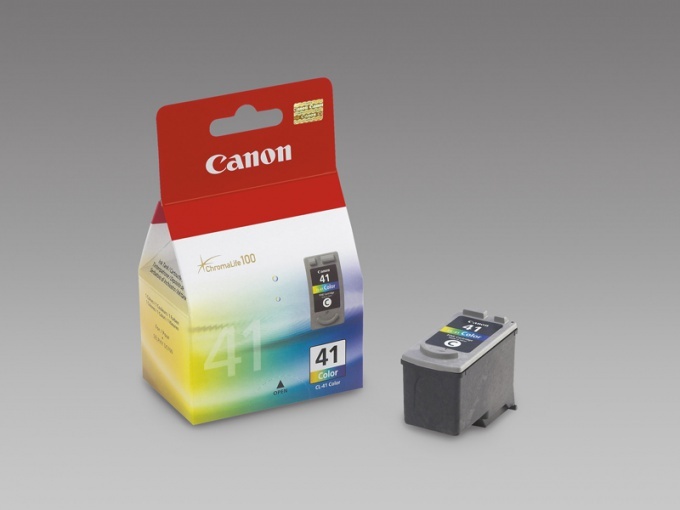 Refill for inkjet cartridges Canon CL-41, CL-51. Insert the thumb from the set of the filling opening, as shown, and turn clockwise not less than 6 times to widen the hole for refilling the cartridge. Repeat the process for holes of all colors. Remove the cap from the ink tanks and put on the needle. Very slowly fill each of the ink containers in accordance with the colour (CL-38 - 3 ml. each color CL-41 - 4 ml, CL-51 - 6., CL-441 - 3 ml, CL-441XL - 5 ml., CL-511 - 3 ml, CL-513 - 4 ml). 4. Carefully stick the label back exactly as it was before the filling or glue the lid (if you used this method). 5. Put the cartridge under some paper or thick paper. 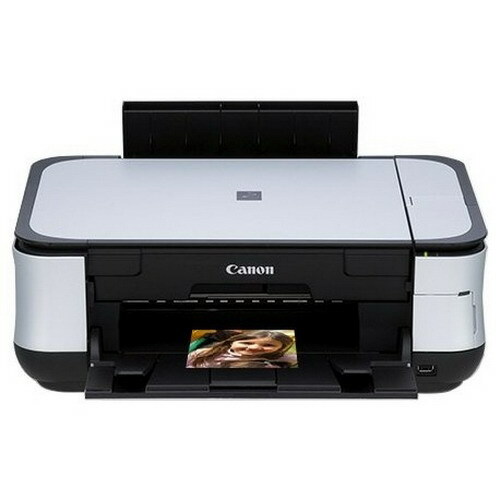 Laser and inkjet printers of Canon are widely distributed and are popular. They are easy to use, have high reliability. However, every user of your printer sooner or later faces the need of filling. Refill Canon PG-30, PG-40 and PG-50 inkjet printers is easy. Put the cartridge on paper towel, then very carefully drill a hole in the recess in the bottom of the cartridge, just below the icon "B". Dial a syringe of 20 milliliters of black ink, very carefully and slowly enter it into the drilled hole. Remove the needle of the syringe and seal the hole with tape. Refueling is done. Put the cartridge into the printer and leave it on for 5-8 hours, then 2-3 cleaning cycles. To reset the counter, notifying about an empty cartridge, press and hold button feed paper. Before you refill your Canon PIXMA IP4300 and the like prepare the five syringes according to the number of ink bottles. Don't forget that the printer installed just two cartridge in black color with different sizes. A small cartridge is refilled with ink, water-based, high – pigment-based. The first one is used when printing images, the second when printing text. Prepare some paper napkins so as not to smear the table. Turn on the printer, open the top cover. When the printer push the cartridges, proceed to the gas station. You can start with any cartridge, but it is better to fill in order from left to right (or Vice versa). Remove the first cartridge, put it on a napkin. Take a sewing needle, hold it with pliers and heat in the flame of the lighter. Then a hot needle, very carefully pierce a hole in the right front corner of the cartridge. The diameter of the hole should be such that it held a needle syringe. If around the hole formed molten roller, carefully cut it with a sharp knife or razor blade. Dial a syringe full of ink of the desired color, place the cartridge in the bottom hole above the ink bottle (to press out drops dripped into the vial). Insert the needle of the syringe into the holes and insert the cartridge, the ink level should almost reach the hole. After that, take the needle of the syringe and seal the hole with tape. Refueling is finished, insert the cartridge into the printer. Other cartridges are filled the same way. Do not mix black ink on the bottle for the large cartridge must be the words "Pigment". 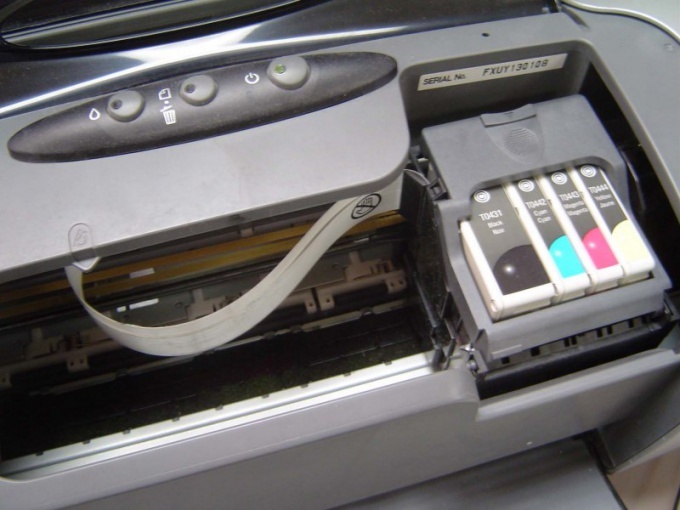 Note that after refilling the printer will still display information that the cartridges are empty. When this message appears, just click "Continue printing", the ink level sensor of the appropriate cartridge will be disabled. Refill laser Canon printers also is not very difficult, but requires accuracy. One of the most common is the Canon cartridge EP-22, it is used in the Canon printers LBP-800, Canon LBP-1120 etc. For the filling you'll need toner HP AX (5L, 1100). Remove the protective cover covering the drum, prying it with a screwdriver under the axle. Do this very carefully, not to lose the spring. Then use the pliers to remove the drum axle from the gear. Pry the halves of the cartridge and carefully, picking only the gear, remove the drum unit. Wipe it with a soft cloth and put in a dark place. With tweezers, remove the PCR – rubber is right under the drum unit. Touch it with fingers! Wipe from scale and set aside. Then remove the axle that holds the spring-loaded halves of the cartridge. One axle is removed to the outside, the other inside. If the cartridge had not refueled, the second axis emboss inside with a hammer, it should break through the plastic partition. Remove the blade cleaning by unscrewing the two screws on the edges. Clean the tank of debris, put the blade in place. In the second half of the cartridge (toner) remove the cover on the side opposite the gears, to do this, Unscrew its retaining screw. Remove the cap from the filling hole and using a funnel to gently pour in the new toner hopper. Do not go to sleep until the toner filling hole, leave about two inches free space. Otherwise, the cartridge may jam. Close the stopper in the filling hole, reassemble the cartridge in reverse order. Wipe it from the remnants of toner, lightly shake to evenly distribute the toner in the hopper. Insert into the printer, close the cover. Print a couple of test pages. The first page may be slightly stained with toner, the print quality will be normal.